Hey there, dork. 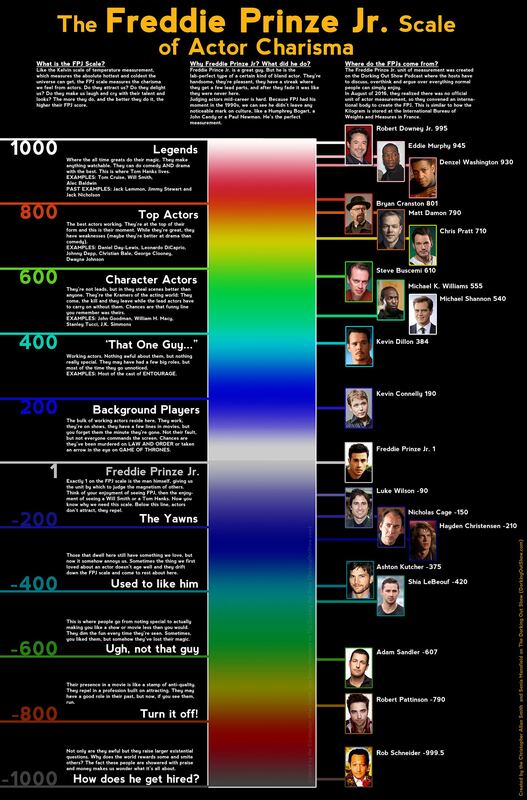 In this week’s episode we unveil our newly created metric for measuring an actor’s charisma: The FPJ scale. The FPJ scale is based on Freddie Prinze, Jr. Why Freddie Prinze, Jr? You’ll have to listen to find out, but we do have a handy graphic that explains it very well. We also review the R-rated animated comedy “Sausage Party,” and discuss the current state of outrageous comedy in our current outrage culture. Plus, we share a few recommendations for you, including “The Get Down” on Netflix and the book “Into Thin Air.” All of that, plus our favorite headlines of the week. You can listen to it here, or you can find us on iTunes, Stitcher, and YouTube. This entry was posted in Uncategorized and tagged comedy, entertainment, film, films, funny, humor, movies, podcast, podcasting, podcasts, pop culture, television, TV, TV shows by dorkingoutshow. Bookmark the permalink.